While lead is useful in many industrial applications, in water lead is a toxic metal that can cause serious damage to the brain, organs and blood cells over time. Lead occurs naturally in ground waters throughout the world, but most contamination of lead in drinking water comes from lead leaching from service pipes, fixtures, valves, and other materials containing lead. Lead in drinking water can cause a variety of serious health effects. In babies and children, exposure to lead in drinking water can cause delays in physical and mental development, along with slight deficits in attention span and learning abilities; in adults, it can cause high blood pressure and kidney problems. The United States Environmental Protection Agency (USEPA) estimates that approximately 20 percent of human exposure to lead is attributable to lead in drinking water. (The greatest exposure to lead occurs from swallowing or breathing in lead paint chips and dust.) This is because lead is commonly found in household plumbing materials and water service lines. Homes built before 1986 are more likely to have lead pipes, fixtures, and solder. However, new homes are also at risk: even legally “lead-free” plumbing may contain up to 8 percent lead. The most common problem is with brass or chrome-plated brass faucets and fixtures, which can leach significant amounts of lead into the water, especially hot water and instant hot systems, unless they use lead-free fixtures. Lead is strictly regulated in public water supplies, and the USEPA sets a maximum allowable level of 15 parts per billion, or .015 milligrams per liter. Generally, water that is first drawn after sitting for several hours in piping that contains lead is much higher in lead concentration than water drawn after the pipes have been flushed. For this reason, when one is testing for lead, the water should be allowed to sit in the pipes overnight, to determine the “worst case scenario” of your lead contamination. Our WaterSafe Well Test Kit and Well Water Pro II Test Kit both include tests for lead; the latter also includes a prepaid mailer for sending your water in to our lab for analysis. Lead problems can often be corrected by replacing lead service pipes with new piping, by replacing lead-leaching brass fixtures with new non-leaded brass, and/or by treating for corrosive water conditions to prevent the water from leaching lead from the piping or fixtures. For lead removal in drinking water at point of use (such as one sink), consider an NSF certified reverse osmosis systems, NSF certified carbon block filters that remove lead. For whole house treatment, or for small communities with lead in ground water, we offer custom systems for specific applications. These systems typically employ a special metal oxide media designed for lead removal. Pretreatment and total system design is important. We also offer corrosion control products for correcting corrosive water conditions if the lead is leaching out of the distribution system. 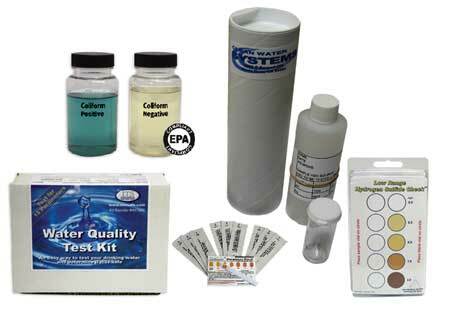 You can browse test kits and whole house water treatment systems in our online store, and visit our resources page for more info on all sorts of well and city water problems and treatment methods.